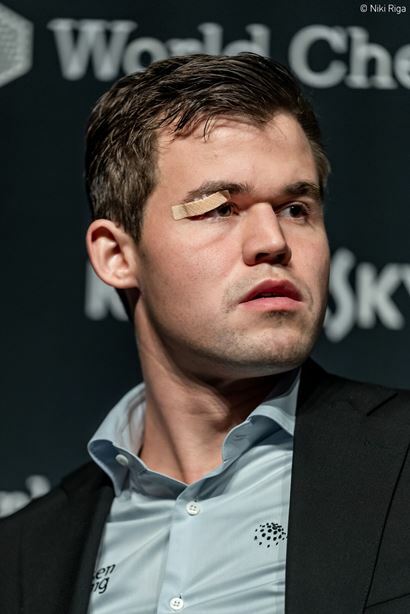 World Chess Champion Magnus Carlsen went into Game 9 of his title match against Fabiano Caruana with a black eye, but by the time it had ended in a draw on move 56 it was only his pride that was wounded. 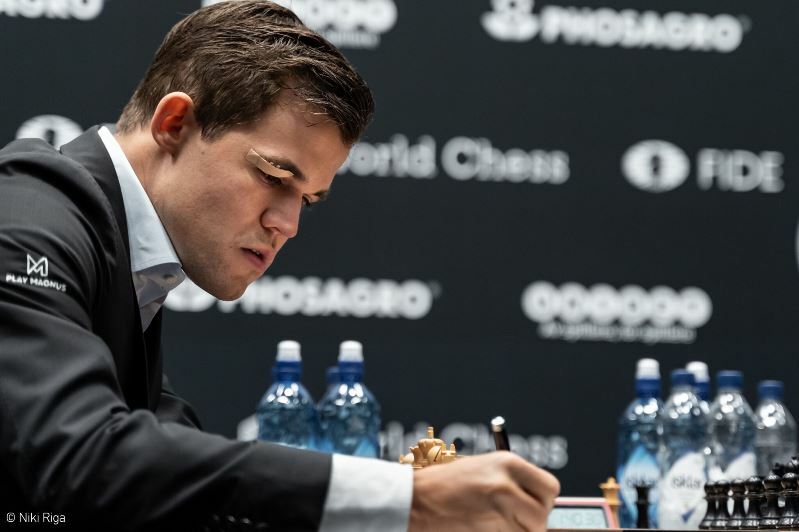 He responded with one-word answers and obvious frustration in the post-game press conference after winning the opening battle but then allowing “his” type of position to fizzle out into nothing in the space of a couple of moves. There are now just three classical games to go before tiebreaks, with Fabiano White in two of them. Were you in any pain from your injury during the game? I wasn’t surprised. I’d looked at the line, but couldn’t remember the details, and it’s a very complicated position, so I was just trying to figure it out as best I could… which I didn’t really manage! It took around 10 minutes for Fabi to play 12…Bb6, while after 13.d4 he agonised another 20 minutes over 13…Bd5. Objectively it looked as though Black should have been fine, but it was a strategically risky position in which to be on your own. 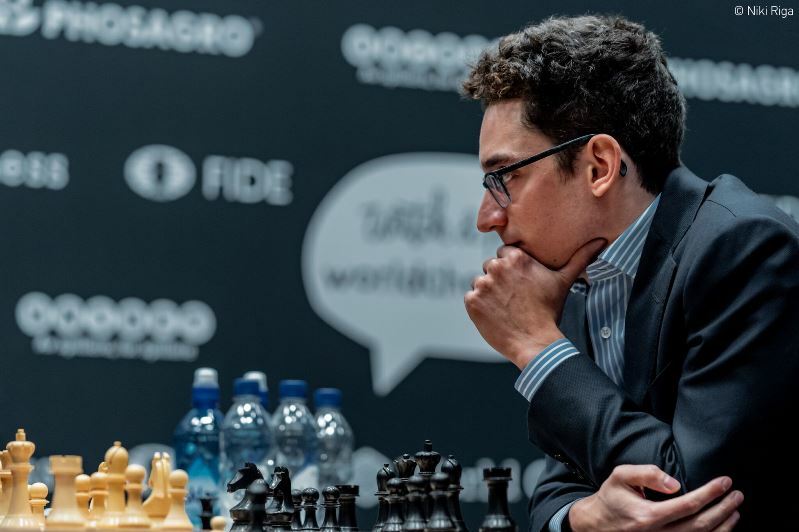 His dream scenario would have been for the game to end in a draw by repetition at this stage, but Magnus had no interest in that… much to the relief of the watching Anish Giri! I have other moves I can play – 17…Na5, I can play 17…Qd7 or 17…Be4 – I have so many moves here, but I didn’t feel totally comfortable. I thought if I start to drift it could get very unpleasant. White's moves are easy – e3 and then Nd2 at some point. So I wanted to make it more concrete. Of course I’m basically admitting that my position is very unpleasant, but still the drawing margin is very high with these opposite-coloured bishops… I have less time, so I thought it will be easier to play if I simplify the position a bit. I had kind of mixed feelings about 17…Bxf3. On the one hand it leads to a very comfortable advantage, but on the other hand, as Fabiano says, it simplifies the game quite a lot. If I don’t play 24.h5 then 24…h5 is going to come followed by f5, and it feels like it’s obviously quite comfortable, but I don’t really see how to make progress. It’s just too solid. In the game Fabiano seized his opportunity with the concrete 25…gxh5! 26.Qc4 f5! Basically it wasn’t such a difficult decision as I am getting very quick counterplay with h4. White’s king becomes vulnerable as well. Many moves should draw, but 31…Bc5! was a good sharp reply, since 32.Qxc7?? now would run into 32…Bd6! 33.Qc4 f4! and Black wins. It was to the World Champion’s credit that he still managed to reach the time control with at least a nominal advantage, and he would go on to stretch the game out until move 56. I understood it immediately. That doesn’t mean you shouldn’t play. I’m trying to entice him to play h5, and if he does play h5 I at least have a target, but obviously if he just keeps still and keeps his fortress, just waiting for my king to enter, then there is nothing. But there is no harm in playing, and I really don’t understand the point. Grischuk had pointed out during the live commentary that h5 was what Magnus was hoping for, and he also told a story that exemplified the World Champion’s huge determination even when the odds seem against him. It was reason enough to be grateful that the game had been prolonged! The draw, when it came, was historic, but not for the best of reasons! I'm just afraid that Fabi is going to play three very good games now, not be able to break through, and then just be destroyed in the rapid. I’m really not thinking about the tiebreak now. If we get there, then I’ll start to think about it, but there’s still a lot of chess to be played and I really don’t agree with most people about my chances in the tiebreaks. First, though, we have another three classical games to go, and Fabiano will be White in two of them. Earlier in the match that didn’t seem to be an advantage, but in the last few games normal service has been resumed. It’ll be fascinating to see if we’ll again get an open Sicilian in Game 10 on Thursday. Follow all the action live here on chess24, with the pre-game show starting at around 15:10 CET!